Old people keep lists. It’s what we do. 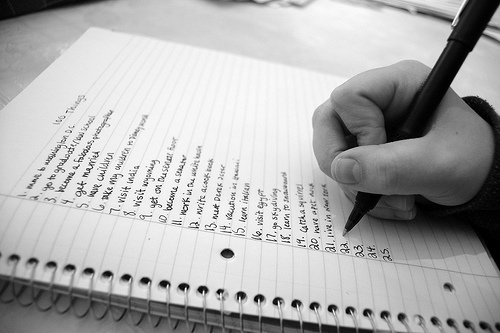 Lists keep us organized, productive and help us to remember things when our memory starts to fade. They also keep us organized. In addition to the standard “grocery list”, “to-do list” and “neighbors that may be communist sympathizers list” that you’d find in any decent American household, I maintain over 200 other active lists at any given time. Don in his in his typically irreverent and crabby way went on to share some of them here. I had no idea until Don’s post my propensity to keep lists was something “old people … do”. I’ve kept lists since I was knee-high to a Coke bottle. Nor am I (as I like to tell myself) anywhere close to qualifying as “old”, at least in the truest sense of that word. I first wrote about my lists, “The Evidence of a Troubled Past” last September here. Although mine won’t be nearly as gut wrenchingly funny as Don’s I thought I’d share more about my own lists with you my friends. Like a lot of people I’m a huge fan of movies. Since my days in college Film Appreciation classes (unbelievably you actually received credit for watching great movies!) I’ve watched and enjoyed movies in a way I hadn’t before. It is afterall one of our truly American art forms. Movies originated here and Hollywood still is the film capital of the world. I recently noted of the Internet Movie Databases Top 100 movies — (actually 250 but I haven’t counted beyond the first hundred) — there are 24 movies I’ve never seen. My list suddenly got larger. These are several of my lists that are posted on the Internet for public consumption. They run the gamut from my Amazon.com Listmainia lists of other lists (confusing huh?) . Among them: my favorite books, categorized by books I’ve read to a Wish list/books I want to read. Take a gander and of course feel free to put me on your Christmas list. It’s just 335 days away. Kindle versions are most appreciated! Relative to my ongoing family history research another public list I’ve created is stories and documents kept at the Internet archive site. One of them is a short biography on the amazing life of Benjamin Henry Latrobe. He’s a distant cousin and while a documentary has been done about him, a full-feature movie would be appropriate. My largest public “list” (the granddaddy of them all) is my Family Tree. Currently containing more than 17,200 names,* along with dates, places, etc. Wow! Crazy what this world has come to and the wacky things we can do with the Internet. Who knew? As I ponder daily what things I might subject you my loyal readers to I have created yet… that’s right… another list. And boy are you guys and gals in for a real treat! Just you wait and see. And with all these lists at my beck and call… I’ll never run out of ideas! Finally, it’s the ultimate list of ’em all… one of the most important. Made famous by the movie of the same title (or was it the other way around?). After seeing the movie I immediately began a new list. It’s a list of things to do before I kick the bucket i.e. before I am deceased, departed, cold as a carp… gone to the great beyond. Travel is a big part of it. Among them I want to see Vermont and Rhode Island, preferably in the fall. They’re the only two states I haven’t seen of the lower 48. Alaska, which I also haven’t seen, will be my final frontier. Among this list of a few dozen I actually got to check one off recently. It was Eat Sushi. Despite my fears to the contrary (with one minor exception) not bad, at all. It didn’t taste anything like chicken. So, what are your lists? Kindly share some of them with the rest of us below. We’ll talk again soon. Thanks for stopping by! back) and that is worth seeing. upon us.. I did briefly land and take off there once but wasn’t allowed off the plane ( a military transport trip ) 🙂 So don’t really consider having “visited”. Hawaii is worth the effort despite Homeland Security. It’s as close to Paradise as anyplace I’ve ever been. I’m looking forward to experiencing Alaska. I’ve heard the scenery there is spectacular. Among the things to accomplish on my Bucket list is to visit Yosemite and other National Parks. Thanks fo your visit and comments. I appreciate you taking the time. Lew ….. you didn’t miss anything. Honolulu is like New York City only filled with Polynesians instead of rude white people. The list that hangs in the back of my mind acting like a burr under the saddle reminds me of the books I hope to write. I dont know how many times people have said to me, “I could wirte a book,” I want to say, “Good, try it.” It’s such a demanding process that my list is getting moldy waiting on me. Know what I mean? Ron. I have an idea Ron. I know writing a book can be very demanding, especially when editors and publishers impose deadlines. I would love to see that list and hear your ideas. I’ve kept list since I was very young too. I used to list all the people I liked in my class and rank them, from 1 to 10. Heavens! My journals are full of lists as well, from my youth on until a few years ago when I switched to blogging. However, I always have paper and pencil beside me to make a list of daily/weekly tasks, grocery lists for Safeway, Costco, Whole Foods. Of course, I have a family tree, a book list, a movie list…oh, I understand lists! So good to know I’m not alone! Let’s not over generalize here,, Rick. Muri will verify that I am not much of a list keeper. Of course, that may be because I have the ultimatum list keeper as a spouse. You are a lucky man Bud! Good for you, that you haven’t been caught up in the endless snare of list-making. The entire cast of Fraggle Rock, baseball card numbers I am missing from my 1986 Topps set, and all the He-Man figures I had as a boy that I gave away to my grandfather’s Belizean nurse so she could give them to her kids when she returned to the old country. Where have you been, Rick? Overworked, underpaid and not feeling all that well have forced me into taking an unwanted break… but so life goes. Thanks for the inquiry Bud… I shall return soon.